Hopefully, by now, you’ve been enjoying the first half of the Summer months (perhaps more so in the Northern than in the Southern hemisphere), and maybe have had time to take a well-earned vacation, travel, spend time with family and friends, or enjoy other leisurely activities. For some of you, however, it’s “business as usual”, with the relentless pursuit of research, teaching, service, and administrative activities. I’m happy to report that the preparations for the 2016 ISER Biennial Meeting in Tokyo, Japan, are proceeding well. ISER has solicited the membership for suggestions for topical platform sessions, which the Section Organizers will soon consider for programming. We’ve received notification recently of a very generous, and forward-going, donation from The Knights Templar Eye Foundation to support Travel Awards for young investigators (see the “membership info” tab on the ISER website for the criteria defining “young investigator” eligibility; www.iser.org). In addition, we are anticipating support from the BrightFocus Foundation to support targeted Travel Awards for young investigators engaged in research on age-related macular degeneration or glaucoma, as well as support from the National Foundation for Eye Research to underwrite the Bettelheim Travel Award for young investigators pursuing lens research. Last year, ISER’s Council instituted a requirement that ISER membership was a prerequisite for submission of abstracts to Biennial Meetings. In part, we modeled this practice on ARVO’s requirement of paid membership as a prerequisite for submission of an abstract for its annual meetings. Council thought that this might be one way of increasing ISER membership. We have received feedback from both members and non-members alike (especially invited speakers who were not traditionally ISER members) regarding this policy. Council deliberated at length about this issue at its May Council Meeting, and decided to discontinue the membership requirement for future ISER meetings. However, members should be aware that the cost differential between meeting registration fees for members vs. non-members is substantially greater than the membership fee — so it makes good sense for one to be an ISER member, if you’re planning on attending the Biennial Meeting. By the end of this calendar year, the terms of office of several members of ISER Council will be coming to a close. These include: Secretary; Vice-President/Europe (2 positions); and Vice-President/Americas (1 position). Elections will be held in the Fall of 2015 to fill these vacancies, and notifications will go out via eBlast to the membership, soliciting nominees. If you or someone you know has the qualifications and the desire to serve, please submit a nomination per the eBlast instructions. I highly encourage members from all three geographic regions served by ISER — the Americas, Europe, and Asia-Pacific — to consider running for elected office, or to volunteer to serve on an ISER committee. You may notice a new feature on the ISER website: the “career center” tab (top, right). This is a place for ISER members to post job openings at their institutions (e.g., faculty or postdoctoral positions) free of charge. [A charge of $200 USD will apply to non-members.] Instructions for how to post a career opportunity can be found on that site, or send an inquiry to mail@iser.org. Please remember to submit a Lab Profile to mail@iser.org. [For examples, see prior issues of this Newsletter.] This is a great vehicle for advertising the research your lab does, as well as for recruiting new students, postdocs, and staff. Also, if you have something particularly noteworthy to report, plus consider submitting it for the newly launched Kudos! column of this newsletter. There are a number of other new developments impacting ISER members, which are reported under the bylines of the various committees, below. I encourage you to read these as well. In closing, I wish you all a very pleasant and enjoyable remainder of summer! The Communication Committee is pleased to announce the official launch of the ISER listserv called Eye2Eye. This forum is a member-only benefit, which allows you ask questions, request feedback, and share resources with other ISER members. To post a question or share a helpful resource, send an email to Eye2Eye@lists.aao.org. Your email will reach all ISER members! We hope that Eye2Eye will serve as a forum for ISER members to share resources, establish collaborations, and ask questions of experts in the ISER Community. The Eye2Eye Guidelines can also be found on ISER’s website. I look forward to reading your forum contributions and being a part of the ISER community! Goldis Malek, member of the ISER Communication Committee, has created a Linkedin page for ISER! Please get “Linkedin” to ISER by using the link below to visit ISER’s page, and become an ISER Linkedin follower. The more followers we have, the more non-members will learn about this great Society. I hope you will enjoy our new social media presence and that it will assist you in your studies. The glia of retina have an intimate relationship with the retinal vasculature. 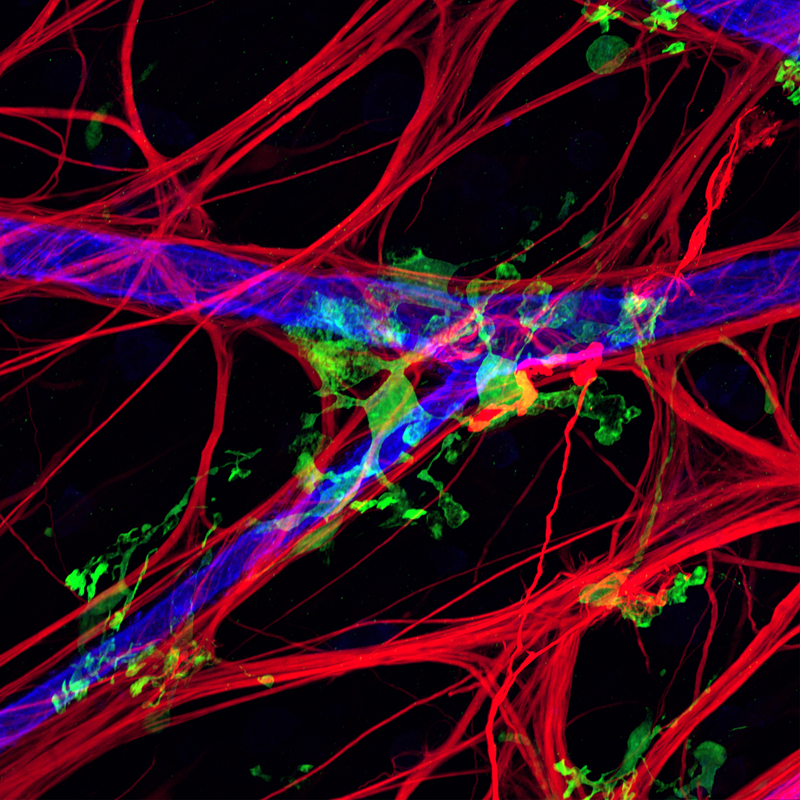 This confocal image shows microglia (green, Iba1+) enwrapping blood vessels (UEA lectin+, blue) in an aged human retina. Astrocytes (GFAP+, red) ensheath the vasculature and communicate with the blood vessels via their end feet. 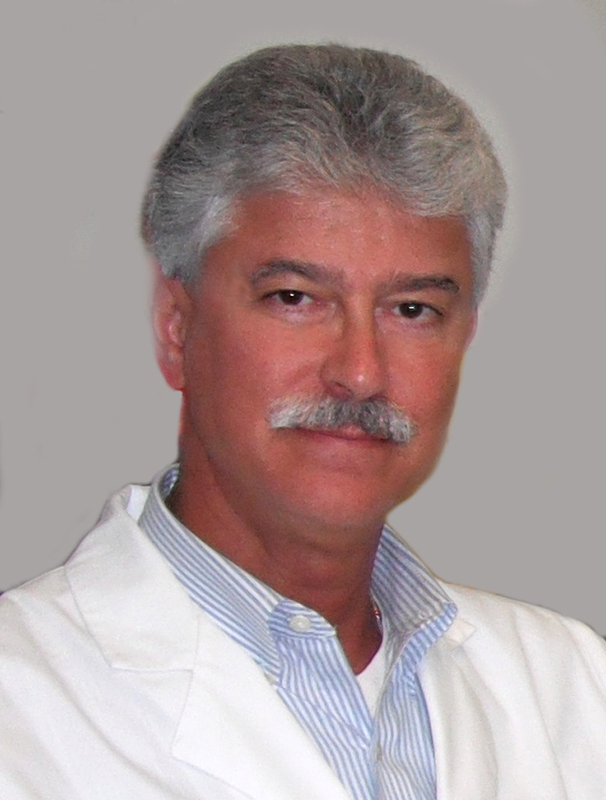 In case you haven’t already seen the May 2015 issue of ASBMB Today, there’s a great article written by Mollie Rappe highlighting one of ISER’s esteemed members, Dr. Allen Taylor of Tufts University, Boston, Massachusetts, USA. If you know of an ISER member deserving recognition for an outstanding professional accomplishment, or if you’ve made an accomplishment yourself, don’t be shy! Notify the ISER office! 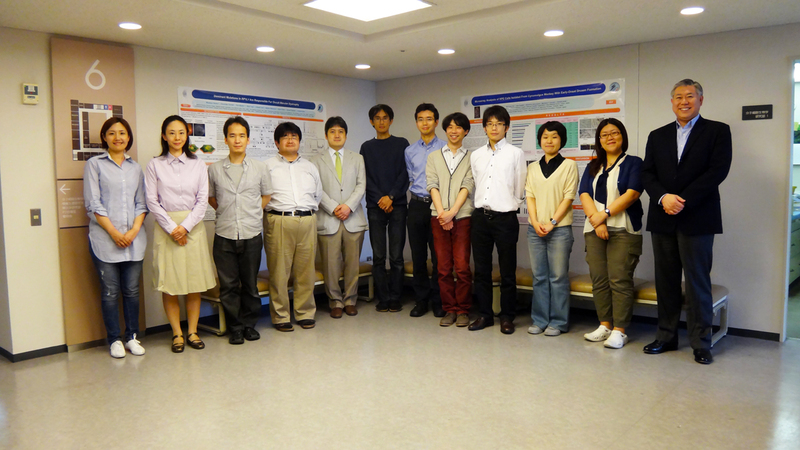 WISER held its second event as part of the ARVO meeting in May 2015. Thirty-five research scientists including PhD students and senior academic researchers attended the gathering for a dinner and discussion. Attendees were from USA, Europe, Australia, and further afield. Among the attendees were 2015 Proctor Medalist Professor Pat D’Amore MBA, PhD, FARVO (RC) Schepens Eye Research Institute, who attended and co-chaired the evening, John Ash, PhD, Associate Professor of Ophthalmology, University of Florida and past President of ARVO, and Martine Jager, MD, PhD, ARVO Foundation Honoree 2015. Our deepest gratitude goes to Mary Kelly who coordinated the venue. After a hearty Italian dinner, the group shared personal experiences on their career development in vision science. Tara Moore opened the discussion by outlining her career progression as a scientist who traveled the world to develop her career. Tara discussed her positive experience as a woman in science, mother of seven young children under 10, with a spouse who is a busy consulting Ophthalmologist. Tara described how she felt that there were no obstacles to promotion and progression for hard working females as they gained credibility through their career in science, and also emphasized the need for hard work and effective time management. A number of attendees shared their experiences of challenges they faced in biomedical research and how they have overcome some of these obstacles. Some wise advice came from Magali St. Geniez regarding the need to understand the importance of negotiating laboratory space in a timely fashion. The consensus was one of moving forward positively and not dwelling on the few obstacles that sometimes occur. A number of attendees expressed excellent working relationships with male colleagues, and indeed many cited male colleagues as excellent lifelong mentors and initiators of nominations of females for awards. Discussion also centered on the need for male leadership to take an active role as ‘champion’ for female mentees in creating opportunities on committees/appointments for junior female faculty. John Ash shared his experiences training female scientists, including his observation that most men in the field are welcoming to female colleagues, but to be effective at promoting female trainees and young faculty, the best mentors (male and female) need to appreciate and work with the unique challenges women face in their career path. Others shared the importance of women being more proactive in taking leadership roles and putting themselves forward for tasks and awards, when the opportunities arise. The group also discussed what each person would like to gain from attending WISER events, with the majority of women expressing an interest in a forum to facilitate their learning from other successful women scientists, providing a strong and meaningful mentoring system for the women in science. Examples of initiatives on mentoring and promoting females in STEM (Science, Technology, Engineering and Math) across institutions were discussed. Feedback from the attendees indicated that the evening provided ample opportunity to chat and seek advice. Numerous friendships were introduced, links were established, common research goals were identified, and indeed business cards, mobile phones numbers and emails exchanged. We urge more young women (and men are welcome!) to attend future WISER events. Remember to check out the Career Center on the ISER website. There are currently two opportunities posted. ISER members can post opportunities at no charge. If your lab has an opening, email the position description to the ISER office to have it posted on the Career Page. Don’t miss Dr. Takeshi Iwata’s Lab Profile featured below! Please take some time to familiarize yourself with the resources that live on ISER’s website, as well as the benefits ISER offers to its members. For example, under the LINKS tab lives a long list of granting agencies, as well as other eye research meetings that may be of interest. The ISER PROGRAMS tab describes some of the programs ISER offers their members, like the Mentor Program and the Lab Exchange Program. Not only does the NEWS tab have links to ISER’s archived newsletters, but it also highlights ISER members’ recent accomplishments! Don’t forget about the PRIZES & AWARDS page, where you’ll find award descriptions and instructions. Keep an eye on this page because the 2016 award cycle opens in October 2015! Encourage your Young Investigators to become ISER members! ISER has many benefits for young members including travel fellowships, mentor and lab exchange programs, publishing and presentation opportunities, a new discussion forum, and so much more. ISER offers low membership dues, and also offers a special two-year membership rate. Have your young investigator contact the ISER office for more details. Takeshi Iwata is the Director of the Molecular and Cellular Biology Division at the National Institute of Sensory Organs, Tokyo Medical Center, National Hospital Organization. His principal research interest is to study disease causing genes for retinal diseases including age-related macular degeneration, normal tension glaucoma and hereditary retinal diseases. His laboratory has recently reported the molecular mechanism of normal tension glaucoma by Optineurin E50K mutation. Neuron was differentiated from patient iPS cells to replicate and observe the cellular problem in vitro. His laboratory also tackled the controversial mystery of AMD susceptible genes ARMS2/HTRA1. They showed that transcriptional regulation of HTRA1 gene is influenced by insertion/deletion sequence in this region and choroidal neovascularization in mouse overexpressing HTRA1. Dr. Iwata is now leading the Japan Whole Exome Project for Hereditary Retinal Diseases. Over 30 universities are collaborating with him to identify disease-causing mutations and to identify molecular mechanism of disease onset. This basic information is being used to develop future therapeutics. He recently established the Asian Eye Genetic Consortium (AEGC) with his colleagues in US, India and Asian Pacific countries. His aim is to accelerate genetic studies in Asian countries by sharing information and developing genotype-phenotype database for the Asian population. Dr. Iwata is one of the local organizers for ISER Biennial Meeting 2016 in Tokyo. He looks forward to meeting you all in the capital city of Japan. Copyright © 2015 International Society for Eye Research, All rights reserved.